Congratulations to Crystal Bianco-Stanley whose name we drew from our Facebook fish bowl. She is the winner of a gift card to her favorite restaurant or store. Each quarter we draw a name of one of our Facebook fans and a $25 gift card is the prize. 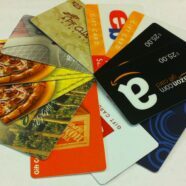 Please call us at 866-268-4696 or send us an email at sales@heritagegown.com and let us know which gift card you prefer. Let your friends and family know about our drawing so they can “Like Us” and be entered into the next drawing. Just “Like Us” on Facebook and you are entered. Please understand that this drawing is in no way sponsored, endorsed or administered by, or associated with, Facebook.